I am a Postdoctoral Research Assistant at the University of York and Research Fellow at the University of Tartu. I set out on my first pilgrimage along the Way of St James in Spain in June 2003 and spent three weeks walking from Burgos to Santiago de Compostela. I walked about 20–25 kilometres every day, slept in pilgrims’ refuges and enjoyed meeting hundreds of people from various countries. 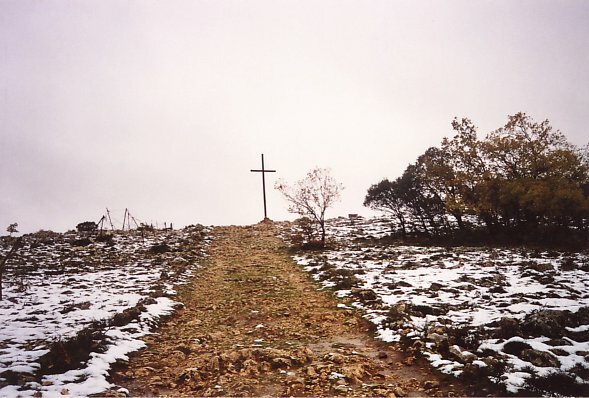 In November 2004 I returned, eager to experience the pilgrimage in winter, mainly because on my first pilgrimage I had heard several people say: En verano hay mucha gente y poco peregrinos; en invierno hay poca gente pero todos son peregrinos. (In summer there are many people and few pilgrims; in winter there are few people but they are all pilgrims). Thanks to walking the Camino de Santiago in different seasons – I have also walked it in spring – I have been able to observe the differences. In the winter there are fewer people, most refuges are closed and the walking conditions are generally harder – the days are short, you may have to walk in the snow or mud, and so on. Winter pilgrims often start walking alone, sometimes from their home anywhere in Europe, and generally speaking, tend to take their journey more seriously than summer pilgrims. All that makes meeting a fellow pilgrim much more special than in the summer; I am still in touch with nearly all the people I met on my winter pilgrimage. Can a similar pattern be observed in England’s cathedrals? Each of our case study cathedrals will be observed over the life of the project during high visitor season, low season and the run up to a major festival. We are now one year into the project and in two cathedrals – Canterbury and York – we have conducted fieldwork in both high and low season. It goes without saying that visitor numbers are considerably higher in the summer, but are the people who come to the cathedral in the summer differently motivated than those who come in a low season? Regarding visitors, can we talk about winter pilgrims and summer tourists? Having spent a month in Canterbury in November as well as in August I can say that it is almost hard to believe that it is the same place. I did meet an occasional ‘winter pilgrim’ also in August but they quickly disappeared into the crowd. This sentiment was echoed by a volunteer assistant who told us that in her experience, visitors who come in the winter are more ‘pilgrimagey’. She said: ‘This is a wide generalisation – I think the people who come in summer tend to be less pilgrimagey --- In the winter it tends to be less about being on holiday, maybe people are more serious… --- They probably ask quite deep and more meaningful questions --- There are more tricky questions asked in the colder months’. This raises a question about the spirituality of a place – does it need to be quiet in order to be spiritual? Why can’t a crowded place be spiritual? From talking to several people it has emerged that peace and quiet really seem to be prerequisites for feeling spiritual. According to some volunteers, one of the biggest challenges is ensuring that there is enough silence in the building – and that is very difficult. Several visitors to Canterbury Cathedral have said that they particularly like the Crypt simply because they can go and be quiet there. While the Nave and Quire are mainly tourist attractions at busy seasons, the Crypt is the only place for prayer. The link between the site and the sacrality of being quiet is very interesting indeed. It probably would not work the same way in some other places of worship, e.g. a Hindu temple or even a synagogue. Several cathedrals have chapels that are designated for private prayer, for example, Our Lady Martyrdom chapel in Canterbury and the Zouche Chapel (off the South Quire Aisle) in York. It seems that almost everybody walks past them, yet very few dare to go in. They are not open for sight-seeing – tourists are discouraged from entering. The downside of this approach is that they sometimes remain hidden from or otherwise inaccessible for those who genuinely need a quiet place for meditation or private prayer. They seem to be privileged places accessed only by the happy few – the ‘chaps who know’, mainly local people. It would be interesting to know how seasons may have affected the motivation and behaviour of medieval pilgrims. Let us see what John has got to say about it!